OK, so I didn't really impress him. But I was invited to a cooking event with him, Wish-Bone's Salad Night Live. As some of you might recall, I am not big on cooking. But I am game to watch chefs in action. Especially when they are hipster chef Tyler Florence. • If you buy fresh herbs, cut off the bottoms (like you do with flowers) and dunk 'em in a cup of water; they'll stay for a week, assuming your kids do not use them for an arts and crafts project. • To get those cool grill marks on stuff you're barbecuing, douse a rag with olive oil and swipe the heated grill. Use tongs if you're too chicken to touch a hot grill with a rag. Go on, impress your friends and family. • Get knives sharpened on a stone, not a wheel. Or you can just get them as a wedding gift and never sharpen them again, like we did. I think Sabrina's child scissors are sharper than our kitchen knives. • Tyler has, at some point, had a knife accident involving every single one of his fingers (I asked). Tyler whipped up three kinds of salads. As I stood there, I realized that there are days when I don't down a single vegetable, and that I really need someone like Tyler to come to my house and make me fancy salads. But I probably couldn't count on him, seeing as how my knives are so dull. 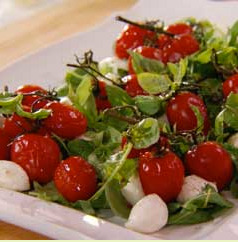 My favorite salad: the Arugula, Roasted Cherry Tomatoes & Bocconcini Salad. Yum. It was totally heartening to hear that Wish-Bone and other salad dressings with natural oils (think soybean, canola and olive oil) help your body better absorb vitamins from the salad. As I was leaving the event, supersweet Frani said she could offer up as a giveaway one of the gift bags we all got. It has Tyler Florence's book Dinner At My Place, salad tongs, a salad carrier, and two bottles of Wish-Bone salad dressing, ARV $45. Just leave a comment below about the easiest dish you know how to make, and I'll choose a winner by this Monday, the 17th. Be sure to leave your email if it's not visible on your blog or I will be forced to chase after you with a dull knife. Update: The winner is Jen. ENJOY!!! The easiest dish I knwo how to make? Fettuccini Alfredo. Really, you need to come visit--I'm sad that you're getting cooking tips from celeb chefs. Love seeing a picture of you, though! Vegetable pancakes. Peel any vegetable that looks like it could be shredded in the food processor. All root vegetables work as do many squashes, both summer and fall, along with eggplant. Put vegetables in food processor and shred. Throw in some onion. Dump out of food processor into large mixing bowl. Add 2 eggs, some starch (flour, breadcrumbs, potato starch, whatever), salt, pepper, and some grated Parmesan cheese (you can add shredded greens if you have them as well). Heat up some oil in a skillet (I use canola but whatever you have on hand works). Scoop spoonfuls of the mixture into the pan. Cook until browned, then flip over and cook until browned on that side. Serve with sour cream, diced tomato, smoked salmon, applesauce, whatever you have that you like with fried stuff. It has steps but they're easy steps. You can multitask during all but the cutting parts and, when I say you can put almost anything into these, I do mean almost anything. I've used all sorts of root vegetables including multiple radish varieties, all sorts of squashes, all sorts of greens, and the quantity of each doesn't matter so it's a great way to use up leftover stuff. Just throw stuff in the food processor until you think you have enough to make 2 or 3 pancakes per person you're serving. I really like the Parmesan but, if you're not that sort of cook, just leave it out. The nice thing is that it tastes different each time because what you put in varies but everyone will recognize it as something that was good the last time so it will probably be good this time too. 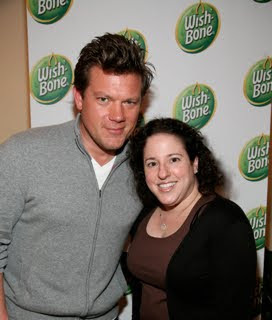 Tyler Florence...Yep...I am totally impressed! My favorite easy dish is whole wheat pasta, cherry tomatoes, mozzerella and pesto. Sometimes if I'm feeling fancy I'll add asparagus and if my meat-eating boyfriend makes an appearance at the dinner table (and if I'm feeling nice) I'll throw some grilled chicken in the mix. The easiest dish I know how to make is chicken casserole - you take 2 cans of cream of chicken soup (diluted with 1 can of milk), add frozen deboned chicken breasts, mixed vegetables and cook for at least an hour at 400 degrees (you have to check the chicken and make sure it cooked so sometimes to takes longer and if the chicken pieces are smaller it takes a shorter amount of time). It tastes great! I have served it over rice or noodles! Chicken stir fry- partially thaw frz chicken tenderloins, slice, stir fry in a little olive oil. Add General Tso's sauce and frz veggies (I use broccoli, snap peas and peppers). Cook til veggies thaw and serve over spaghetti noodles. Hmmmmm. Cooking isn't really my thing. Thankfully my husband loves to cook so that works out well. The easiest dish I can make is chicken pot pie. Cooked chicken, a can of veg all and a can of chicken gravy in a store bought pie shell. Doesn't that demonstrate my superior cooking skills? oatmeal and pb&j! And I can also make brownies...Oh now I'm hungry! Add carrots of your choice. I use canned julienned because all my kids will eat them. Do scrambled eggs count? Or Spanish rice burritos. Love to cook, don't love cleaning up the mess. We love to have cheese and crackers - filling and satisfying and it has protein. The other thing we like is ready made pasta (like tortellini) and making a quick "sauce" of olive oil and spices. So cool that you got to meet Tyler. Homemade pizza. Dough + flour water, salt. Top with whatever is in the fridge. Our favorite is bbq sauce shredded chicken, red onions and cheese. Great tips and JEALOUS! I'd love to meet him! Easiest thing I make... do pancakes count? How about tuna noodle casserole? I LOVE Tyler - so cool you got to meet him. I have to admit, the easiest thing I know how to make are reservations. I am amazing at pouring a bowl of cereal. Usually I come home from class around 7:00 and am starving by the time I get through the front door. I grab a box of Chex, add a scoop of sugar, slice up a banana, add the soy milk and BAM! Easiest (and quickest) dish complete! Anneheuser, those vegetable pancakes sound great. Sounds exciting:) http://notecook.com/desserts/pies/three-step-buttermilk-coconut-pie/ This is my easiest recipe. So simple. Thank you, and keep up the good work educating and advocating for special needs children! Oh, BTW, just an FYI Tyler Florence has an amazing line of organic baby food. My handicapped child can only eat pureed foods and I tried his line of baby food. It actually smells like whatever it is supposed to smell like. It also comes in unusual flavors like white beans with sweet potatoes and cinnamon. my easiest meal that's a family fave? One lb ground beef - cook and crumble. Add enough water to boil thru 12 or 16 oz noodles or elbow mac., without having excess to drain (by sight/trial error). Grab a bag of frozen stir fry veggies - rough chop if they're too big to fit on a fork - dump it all together (oh, and it's a one dish meal as well!). Toss in red pepper flake to suit, a table spoon or two of butter (richness, keeps pasta from clumping, and cuts the peppery zing), and VOILA! Takes 30 minutes tops, and is a well balanced meal all in one pot. I could be wrong, but I think Tyler is looking right at me..and possibly winking? Easiest dish: Chicken and dumplings in the crockpot. Two chic breasts, 2 cans cream chic soup, 1 can chic stock. (Optional- 1 onion chopped). Cook on high for 4 hours. Chic should shread when stirred. Stir in 1 can of ready made biscuits (tear into small pieces) and cook 45 min more until biscuits are cooked. That's it! SO GOOD and SO EASY!! Pork roast with Blackberry preserves. Marinate pork roast overnight - just use a dry marinade in pack that you add water to. Bake at 300 for 1 hour..wrapped in aluminum foil. Open al. foil...spoon 2/3 cups preserves mixed with 1/4 cup chili sauce. Reseal and bake for another 45 minutes. Easy, elegant enuff for guest and yummy!! My easiest dish is chili-cornbread bake. You put two cans of chili (or the equivalent of homemade chili if you're truly a cook - I am not) in the bottom of a baking dish, cover with cornbread mix and bake as directed (a little longer if you like your cornbread firm). The cornbread bottom bakes into the chili, but the stuff on top is flaky goodness. They were serving it at Trader Joe's one day when I was there and it has been my go-to simple dish ever since! And I loved the hint on keeping herbs and lettuce fresh - its always a dilemma for me! Thanks!